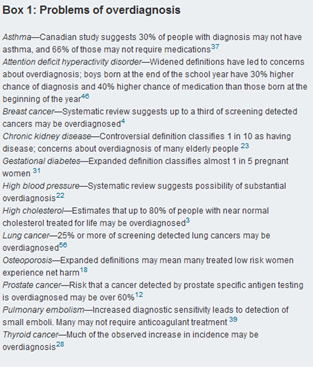 For some background on what overdiagnosis is and in which sense it is a problem you can read this: Overdiagnosed: too much diagnosis is turning more and more of us into patients. Intersting article, focussing on the dark side of our (western) good medical care; many reasonons may contribute to more diagnosis and overdiagnosis, starting with more frequent visits at the doctors and ending up with financial interests of certain groups in distributing their (newly invented treatments)treatments. I remember with ADHD, prevalence increased over the years, as more pills were invented and it became almost a hands-on diagnosis for challenging children (often also labbeld by parents). Therapists these days are struggling, as the labeling a disease provides might be integrated in ones self concept. This way, its hard work to do the externalisation, which SF treatment is able to provide in respectful ways.